Hey there Paper Peeps! 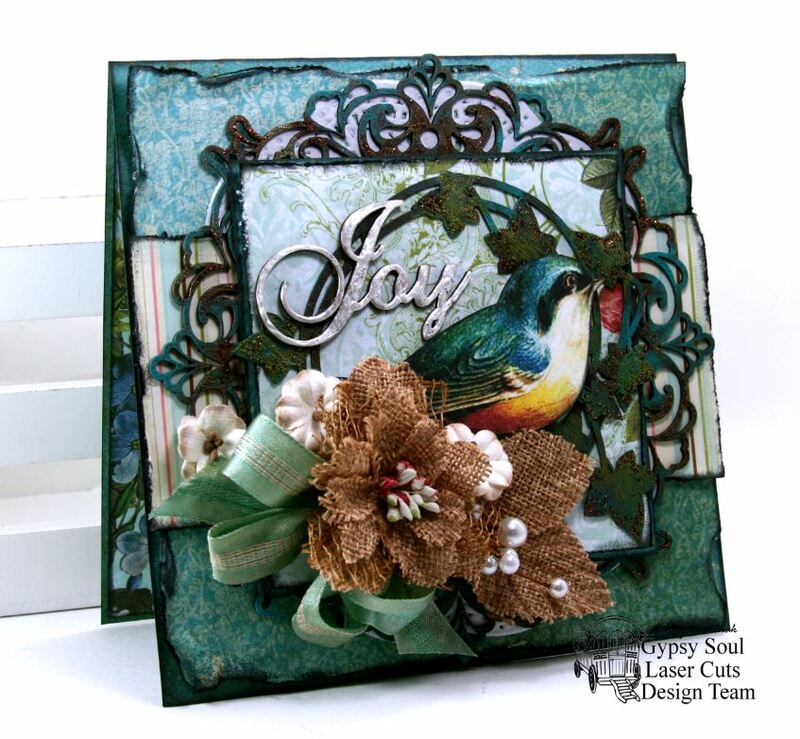 Ginny here to share a very country inspired Christmas greeting card I created with fabulous Cheery Lynn Designs Dies, festive patterned papers and perfectly coordinating ribbon trim. This card is an A2 size with a base of cranberry colored cardstock. 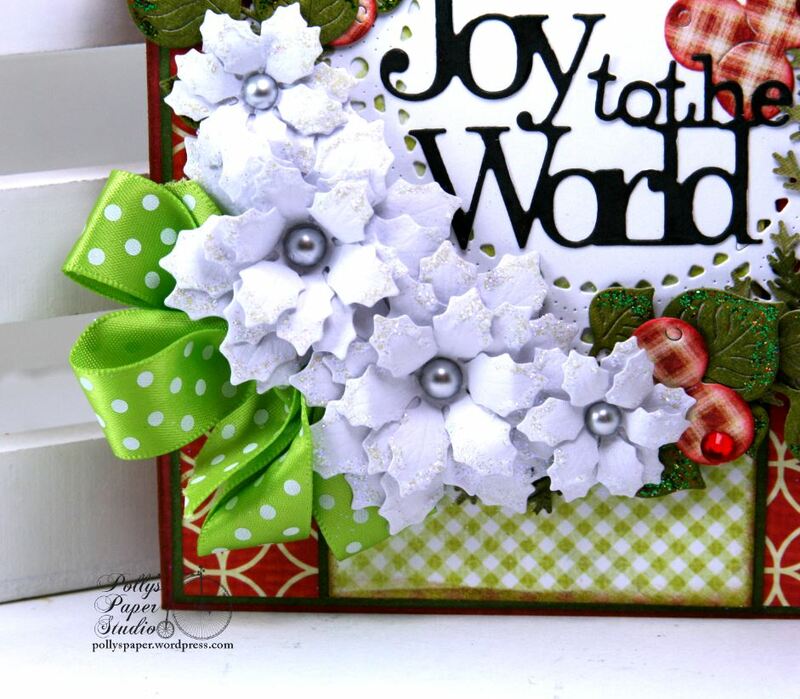 These scrumptious Poinsettias are a delight to make as they go together in a snap. I ran the die through to make 2 flowers…..but left the smaller two top layers off and created separate blooms with them so I got 4 flowers for the price of two hooray! After shaping them and assembling them I added a thin coat of a clear Stickle and sprinkled on a diamond dust glitter for a nearly iridescent look then popped in a pearly accent for the center. To create a fuller wreath I cut two from the Joy To The World die and stacked them up. Additional bulk for the floral arrangement comes fromFlourish #13 leaves that are finished with a green Stickle for a little sparkle. 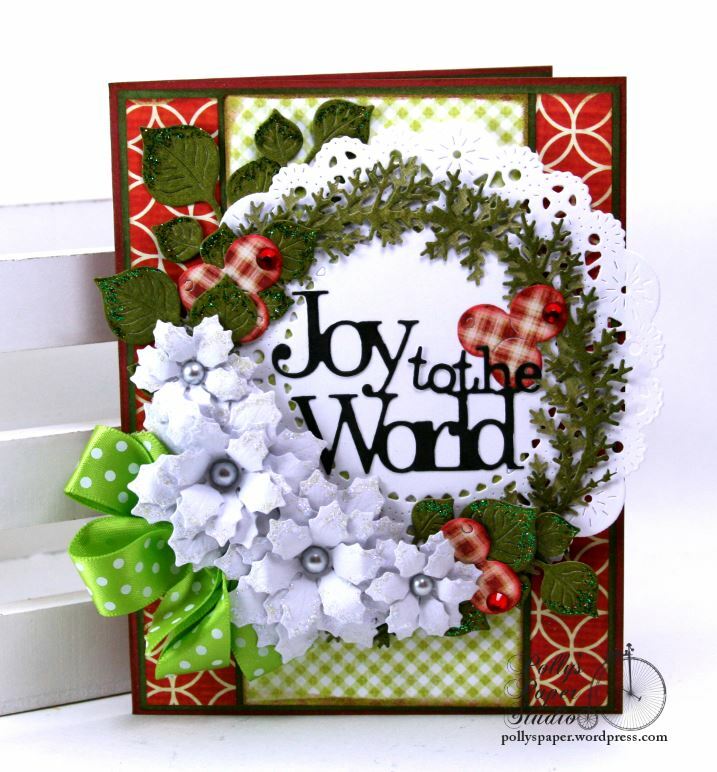 The background is created with a crisp white French Pastry Doily and the tiny berry clusters are a great finishing detail cut with the Holly Leaf die from plaid paper and topped off with red bling..
Hey there Peeps! Ginny here to share a Halloween project that takes me from the sublime from last week into the ridiculous. I’ve got a skeleton hanging from a chandelier like you would find at any great Halloween party. 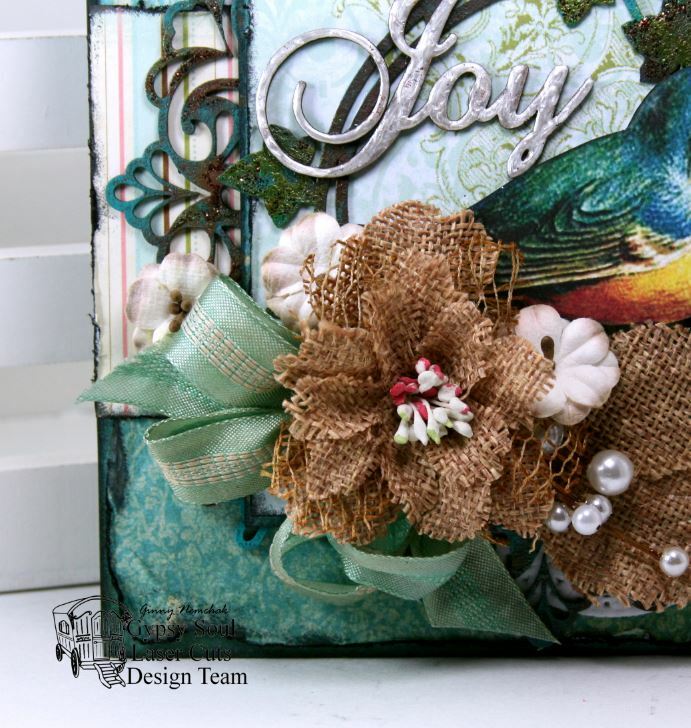 I used pieces from several sets of fabulous chippies to create this fun and whimsical box. 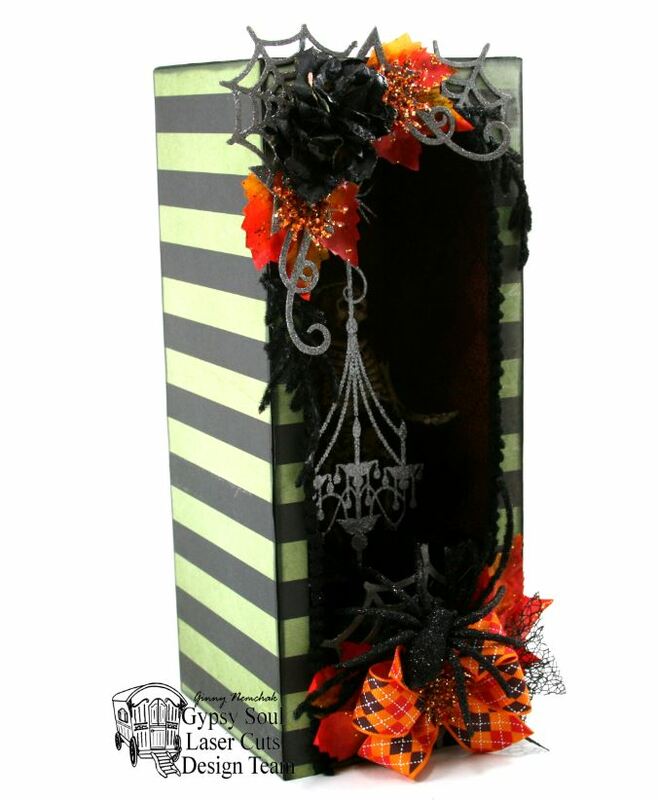 The box is covered with funky Halloween patterned papers to create a backdrop for the altered chipboard. 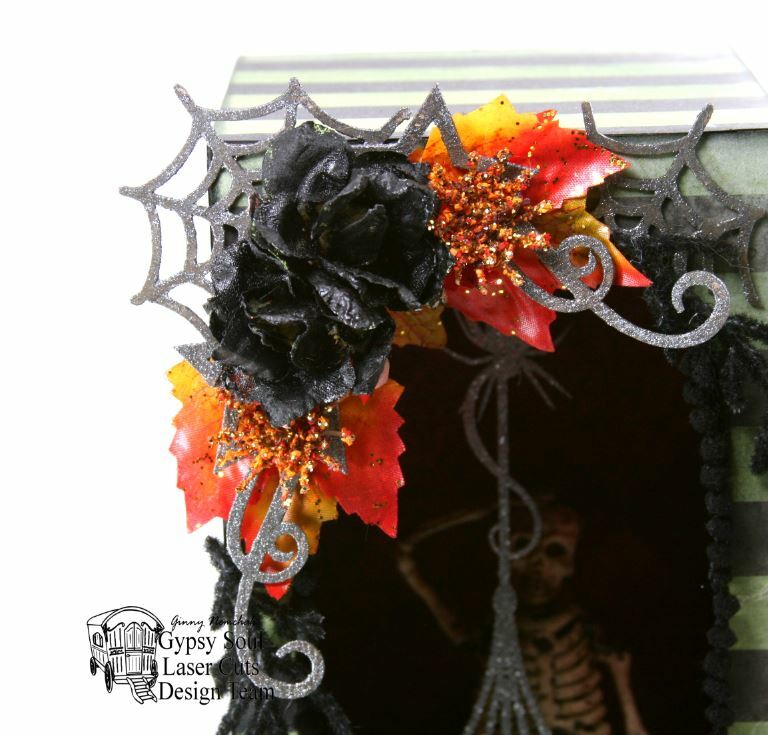 Spider Webs with steel luxe paint create a base to add seasonal embellishments to. The focal point for this arrangement is additional webs and Star Flourishes with fall colored leaves, black roses and sparkly picks. 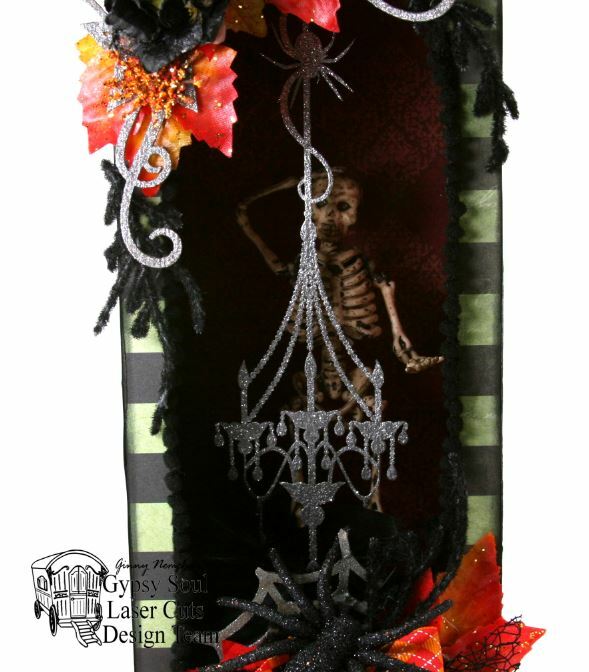 Inside the box is a great embossed chandelier with a party animal skeleton. Hey there Paper Peeps! 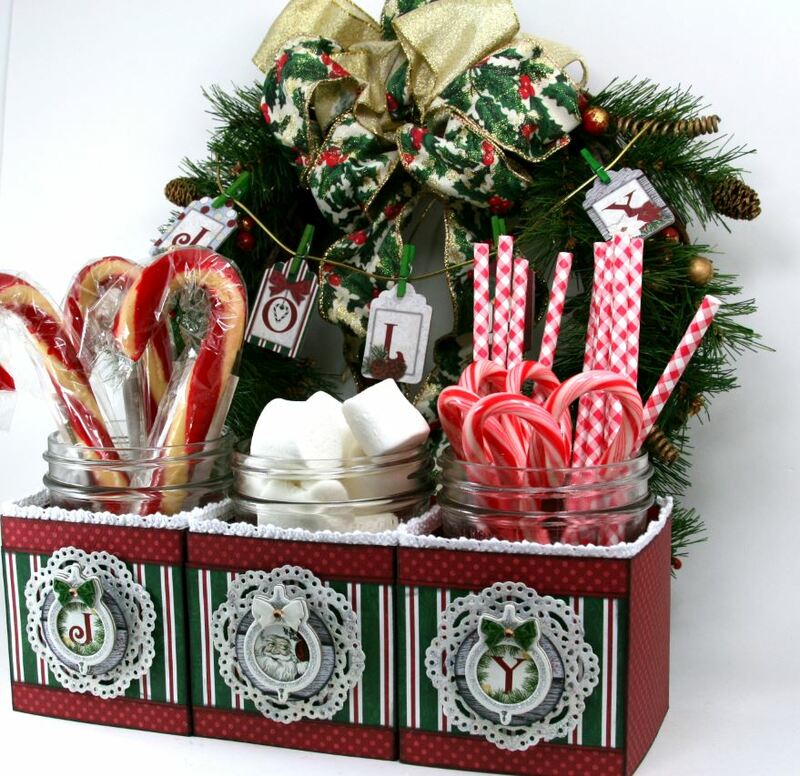 Ginny here to share a fun holiday project just perfect for your next Christmas or winter party. 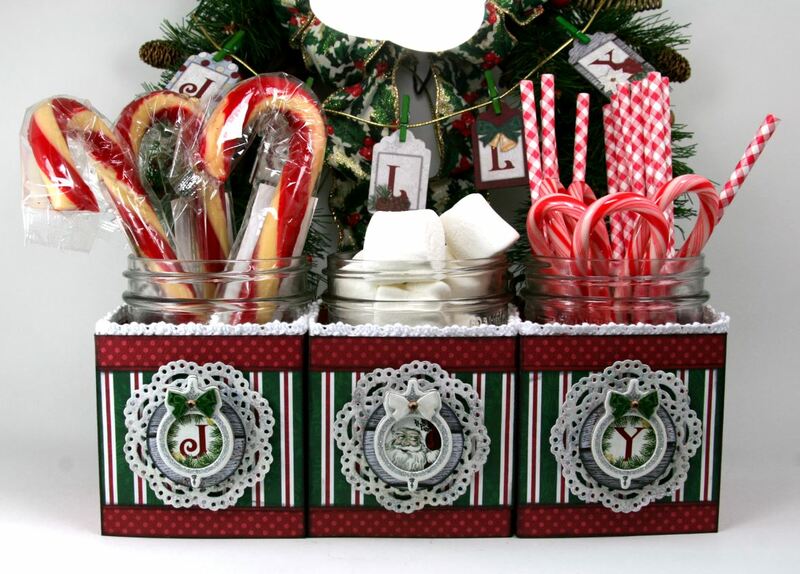 The first thing that came to mind was a way to display fixins for a hot cocoa station. 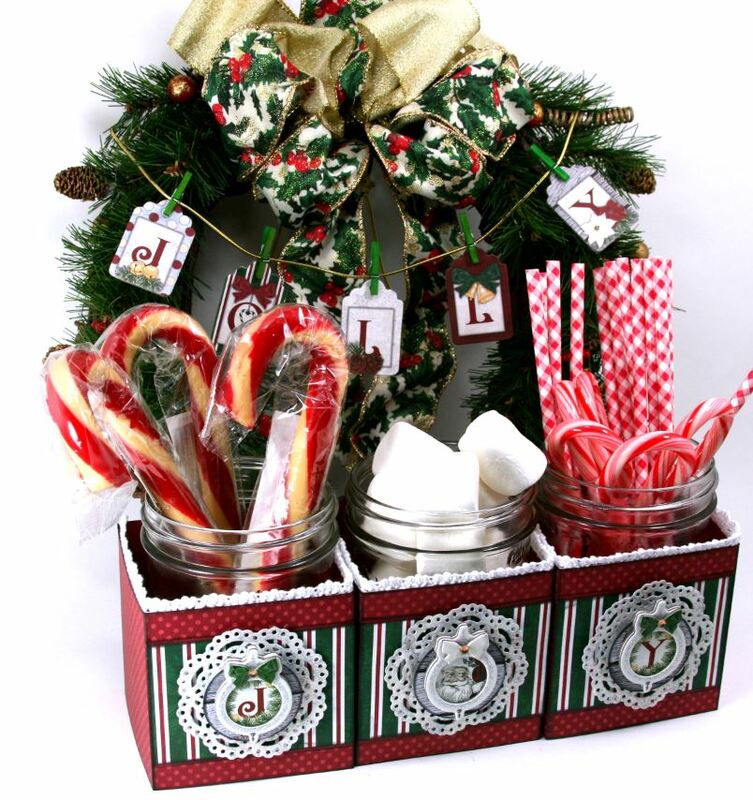 You gotta have marshmallows and candy canes and a fun way to stir your drink. Tis The Season Collection has really great holiday images and patterns in traditional colors which are my favorite for home décor. Containers for food items should be washable so I started with wide mouth mason jars and created cozies to slip them into. 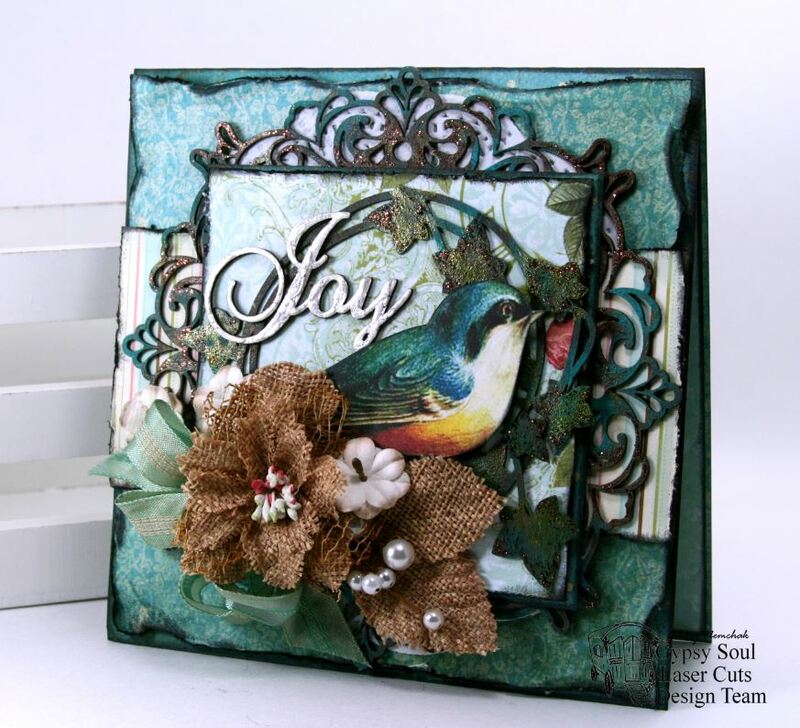 Display them just as they are….or layer them in front of a wreath with a tiny tag banner created with the chipboard tags. I used the Double Dot paper in Cranberry to create the box. There is no bottom to the box making them really easy to fold up and store flat after the season is over. There are 3 cozies shown here but you could create more to serve other toppings. Maybe make another set of 3 that are a bit shorter for smaller jars and stagger them to create a multi-level display. Can you ever have enough varieties of toppings??? I say no you can not! 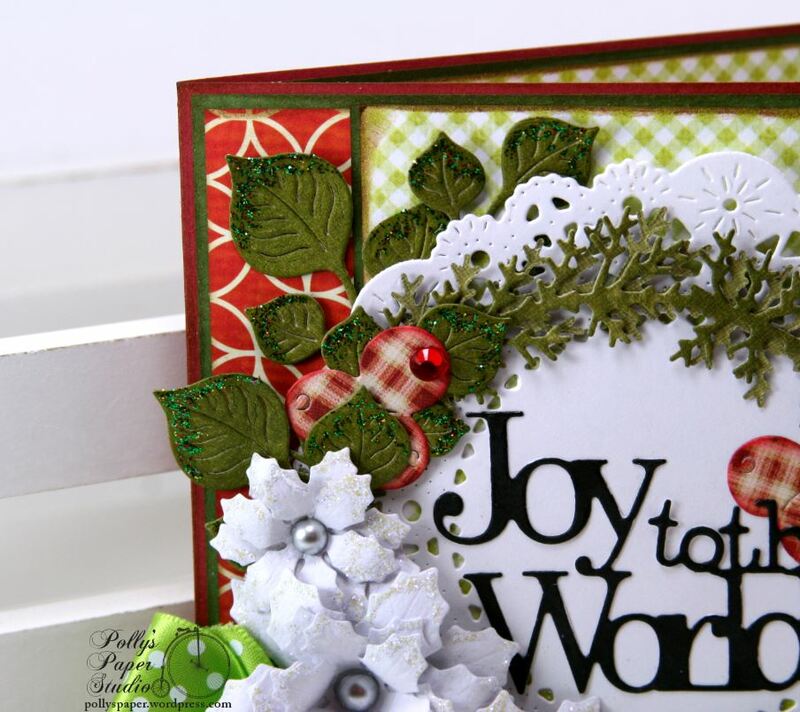 The layered Chipboard in the Tis The Season collection has cute ornament shapes with a Joy sentiment perfect to add over die cuts from the patterned papers. There’s also a great coordinating stripe as a background. 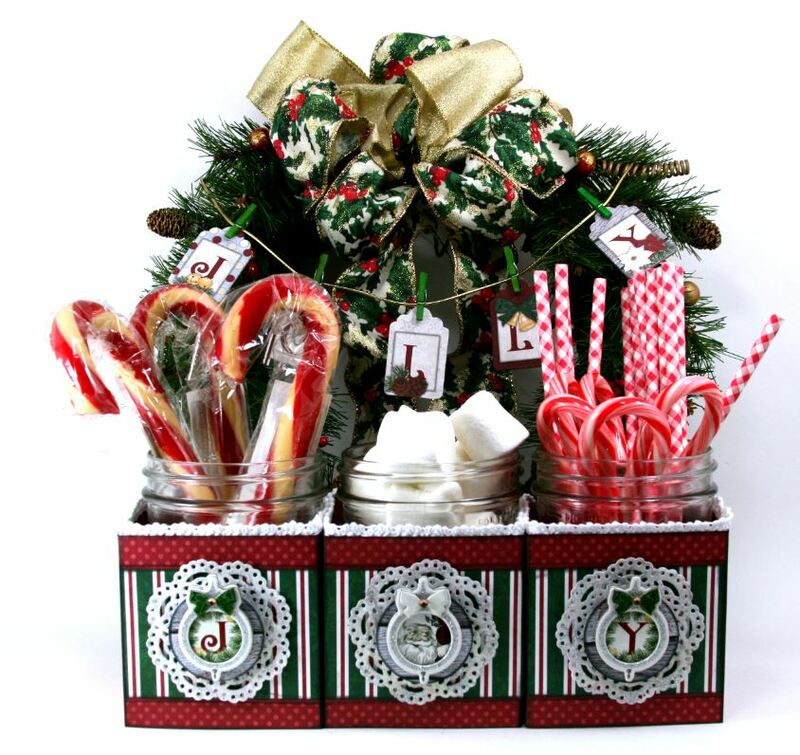 Other snack foods could be displayed in these jar cozies like peanuts or candies. Wouldn’t it be fun to create many of these to serve the goodies for your party then let the guests take one home as a party favor???? I’ll be making these for every holiday now. Hey there Paper Peeps! 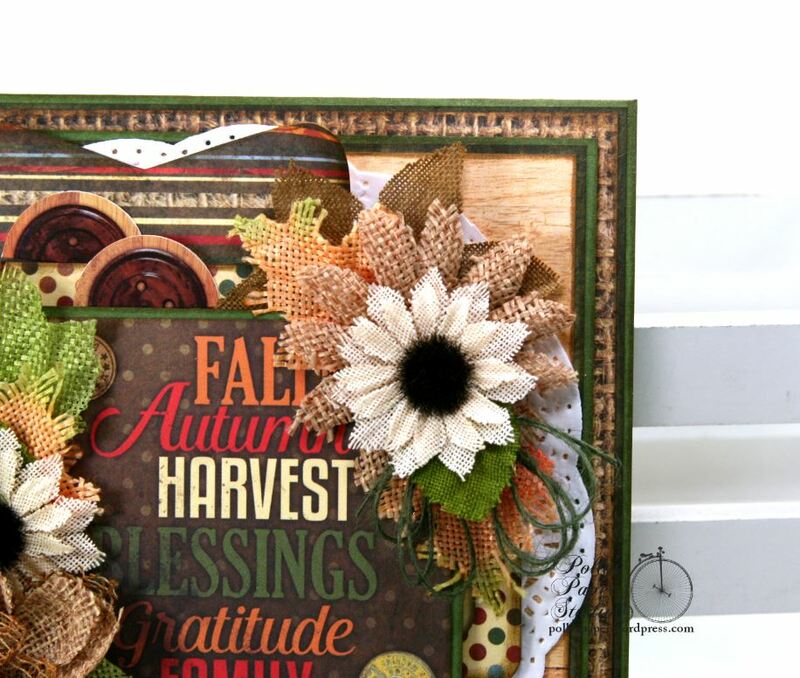 Ginny here to share a Fall Harvest Greeting Card inspired by the super gorgeous burlap flowers from Petaloo. They have such a wonderful texture that goes perfectly with the warmer colors and images of the season. The leaves are really lovely with the iconic shapes and colors of Fall. I layered them up to create a base for the larger bloom. To create balance I added a second smaller grouping with a little loopy twine bow. Spacers were added between the paper layers to add depth and to keep the busy patterns from running together. 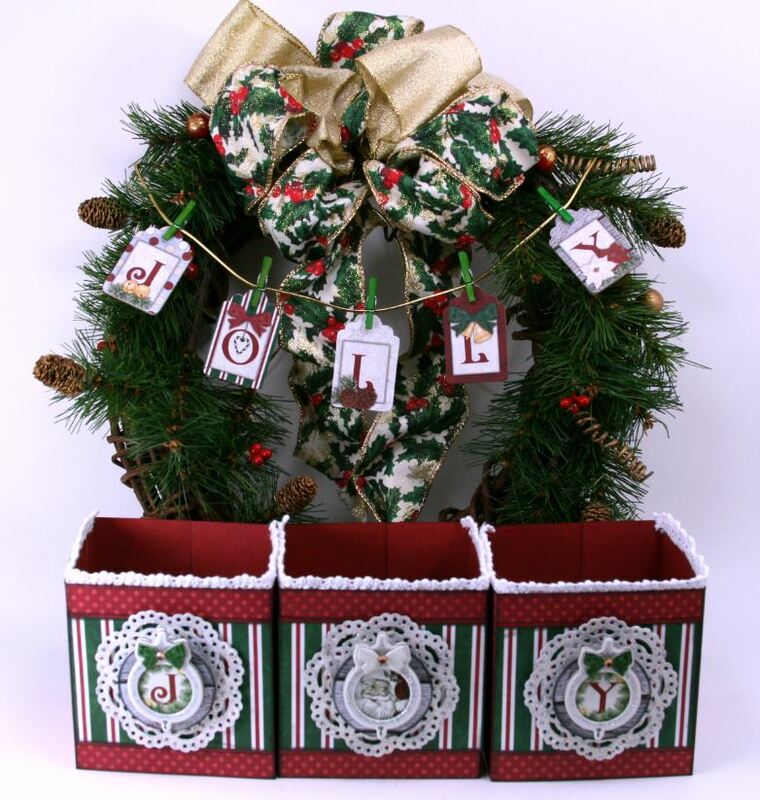 This bottom corner is anchored with a coordinating bow and additional twine loops. 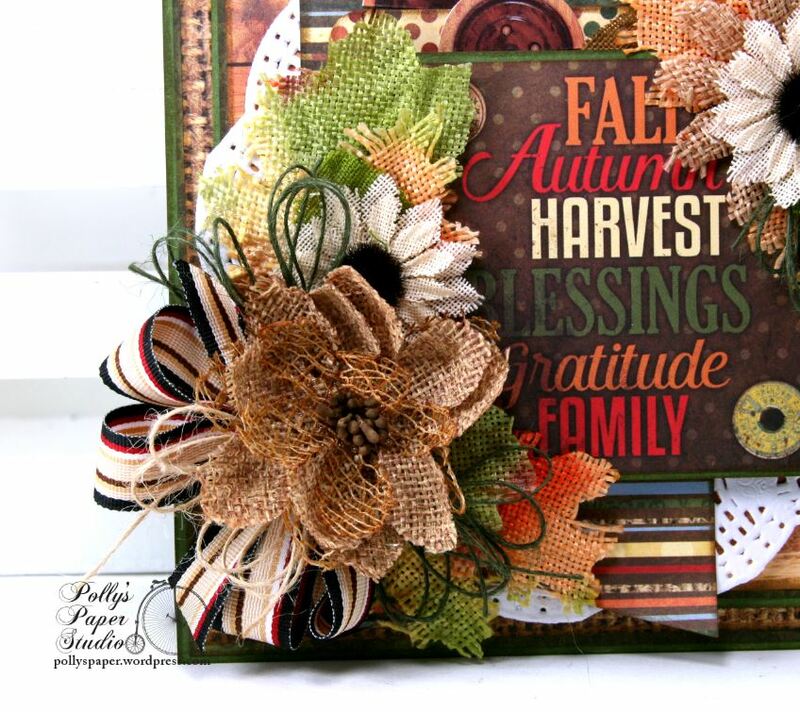 This combination of flowers reminds me of a lovely Fall wreath. To get the layers I wanted without all the bulk on top I tucked a few of the flatter flowers under in image and added some on top. Other supplies used….Really Reasonable Ribbon trims, BoBunny patterned papers. Hey there Peeps. Ginny here dropping in to share a very modern inspired and mixed media Christmas greeting card. 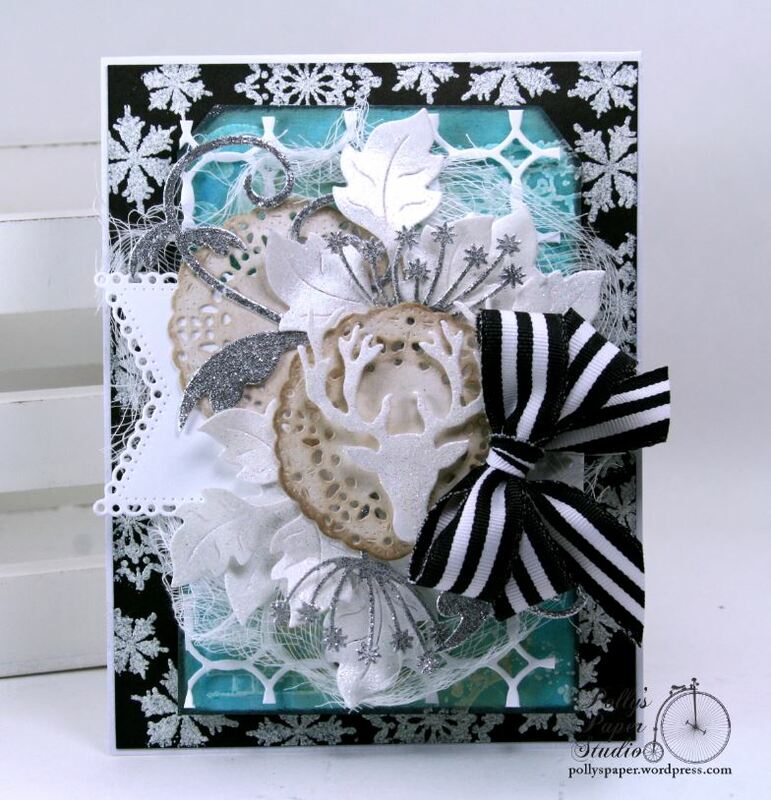 I created this card with just white and black cardstock and lots of inks and die cuts and stamps and embossing supplies. This card is an A2 size with like elebenty hundred dies. Hey there Paper Peeps! Dropping in today to share what I think may be my favorite GSL project so far. 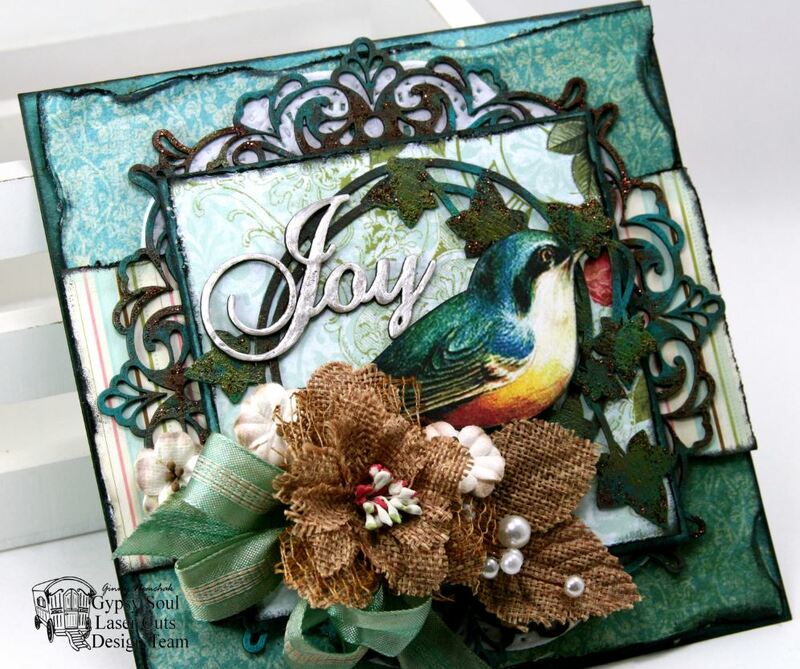 I love everything about it like the birds and the colors and layers! I used a makeup applicator to pounce on many different acrylic paint colors and added some cinnamon Stickles once it was dry. Both of the larger pieces got the same finishing treatment. For the Joy sentiment I just added a nice thick coat of Opal White Liquid Pearls. When it was mostly…but not quite all the way dry I smooshed it down with my finger to give it some texture. 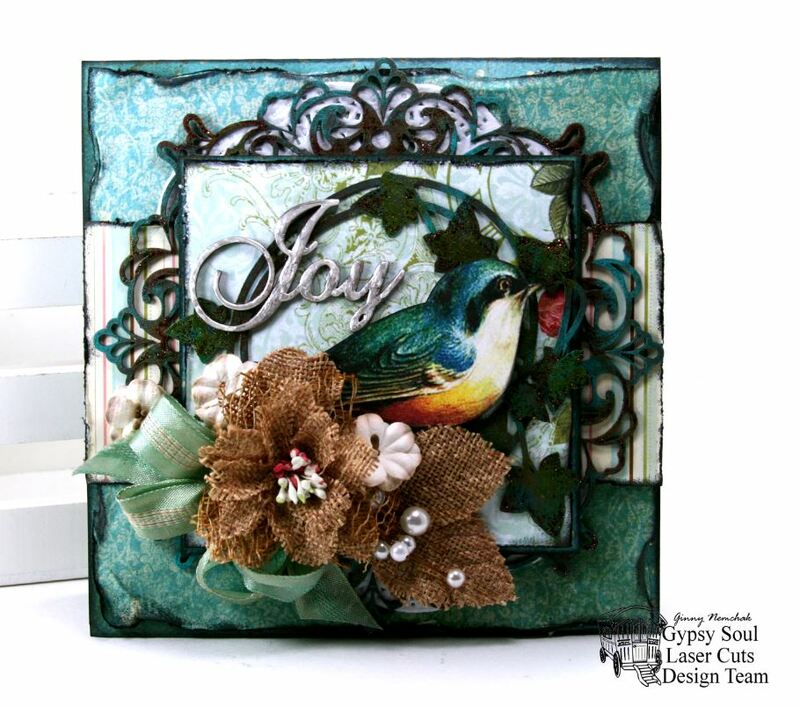 I selected the paint colors to coordinate with the gorgeous fussy cut bird and background paper. There are chipboard spacers between the layers for dimension and a bit of distressing with the Tonic edger. These flowers in burlap were chosen specifically to not compete with the altered chippies. I’m really thinking I should be calling this a mixed media piece instead of a card as it would look really lovely sitting on a mantle or shelf as a nature inspired home décor item. Hey there Peeps. We’re starting another fun challenge at RRR and the theme this time is Things With Wings. 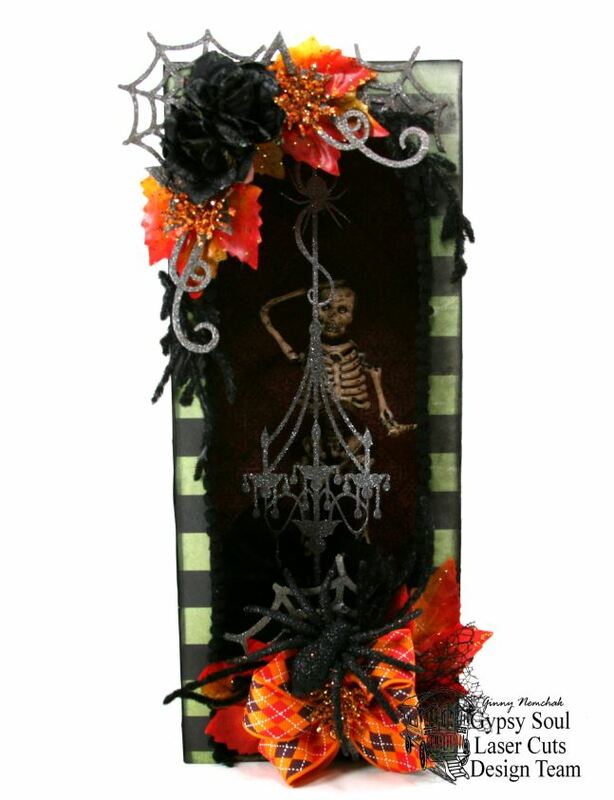 I created a As The Crow Flies Halloween Home Décor wall hanging with a nice selection of RRR trims and ribbons and an image from the Nevermore Halloween Collage Sheet. Really Reasonable Ribbons Used~ Sheer Organza with Satin Center, Wonky Squares on White, Burlap String, Gladys Crocheted Lace, Pumpkins.